Len Saffir’s latest book PR on a Budget is out and I just got my copy from Amazon. Len is the author of Power Public Relations and this is his latest release. I should also mention that I am quoted in the Internet Public Relations chapter of the book. So consider this a plug. <grin> Upon arrival I had a few moments of running around the office saying "yea, I made it into an index!" And then I remembered that scene from the jerk. So I stopped. I’ll be diving in to my copy and follow up. Thanks for another contribution to the public relations industry Mr. Saffir! Second Life seems to be all over my bloglines feeds lately. Lotusmedia on RootsCamp in SL (SL is short of Second Life). 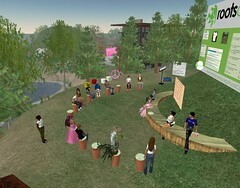 Second Life is a virtual world where you become an avatar of your choosing and virtually/physically interact. While it looks like tremendous fun, I have been quite busy with first life and have yet to sign up for SL. The fact that companies like Electric Sheep are making a living building virtual islands and virtual buildings for major brands makes this noteworthy. It does have a certain bubble feel. It should be noted that mainstream media reporters are not excited about having to login to a virtual world to view your product announcement. The photo is from RubyJ and shows very real topics being discussed. That is cool.